The Groove Thang band is definitely THE best "get off your seat and dance" entertainment party band in the Sacramento and the SF Bay Areas. 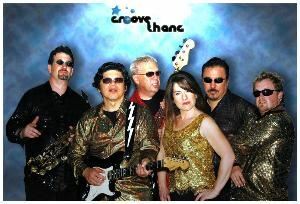 The Groove Thang Band plays a diverse mix of non-stop dance cover music including R&B, Funk, Disco, Smooth Jazz, Rock and yes, even some Country from the 70's, 80's and 90's. Something for everyone! The main concept of the band is to provide the ultimate party machine for your wedding, festival, anniversary, corporate event, convention, fundraiser, or nightclub so that you can have a great time and dance, dance dance! We also provide DJ services alone or in combination with a live band to keep your event moving at all times.